Manual of Equine Lameness provides essential information on equine lameness diagnostics and treatment in an easy-to-use format ideal for the clinical setting. 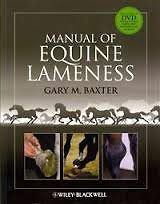 A clinically relevant distillation of topics from Adams and Stashak's Lameness in Horses, this text offers a quick introduction and fast access to key information. An accompanying DVD includes practical supplements, including additional anatomical images, video clips demonstrating key procedures such as perineural and intrasynovial injections, and examples of lameness conditions in motion. Designed for use in daily practice, the book is presented in brief chapters carefully formatted to maximize the usefulness for practicing veterinarians. Manual of Equine Lameness is an invaluable resource to any veterinarian treating lameness in horses and an ideal reference for veterinary students wanting to learn the fundamentals of lameness.